What an eyesore. 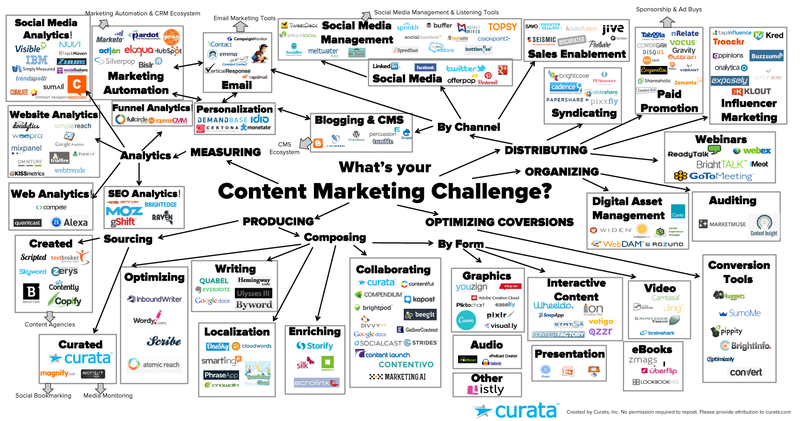 According to this the current marketing technology landscape is a mess. Rather than drawing us into useful information this perversion of a treemap painfully screams “Avert your eyes, for I am a hideous thing.” May God have mercy and grant it a swift and painless death. 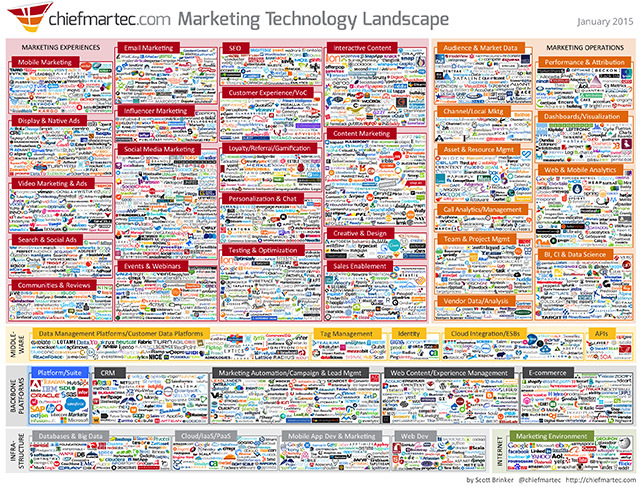 Steve- I think that the point of this graphic is exactly to point out the mess that is the current marketing technology landscape. It’s nor meant to be a useful guide for deciphering the size and scope of the individual players. Especially if you take it in context of the previous year’s versions, the author readily admits that growth in the sector is out of control and having a 1 page ‘lay of the land’ is becoming impossible. This isn’t the impression of Brinker’s intentions that I get from reading his explanation. Here’s his own explanation. Nowhere in the text that accompanies this so-called “supergraphic” does he hint that his intention is to show that “the marketing technology landscape is a mess, which is why I’ve made this mess of a graphic to illustrate the fact” or “I’ve purposely made this an eyesore and unreadable because the marketing technology landscape is ugly and incomprehensible.” Rather, he is so proud of this graphic that he is giving everyone who attends his event a free poster-sized copy. He apparently expects people to read this graphic and points out that they will need a high-resolution version of it to do so. Steven – I am not as certain as you are that this chart has failed to achieve its mission. If that mission was to enlighten us about the state of marketing tech at a glance then it is a failure. Taken by itself it only illustrates one of Brinker’s 4 points. In fact, that might be the only point this chart makes. I was going to suggest that maybe it was meant to be an art piece and not used for informational purposes, but after reading the text that went with it, I guess not. Keep up the good work, Stephen! Jeremy – You’re giving Brinker credit for achieving a purpose that he didn’t intend, unless he mistakenly left “Look at this dangerous jungle” off of his list. Terry – If Brinker intended this as a piece of art–a graphic that is aesthetically pleasing–he definitely missed the boat. I’m going to shift the blame on this one. Shneiderman (and the rest of the visualualization research community) SHOULD weep. We failed this person. Sure you lose control of an invention once you send it out, but you should offer some usage guidelines before releasing it. That’s what treemaps were missing for years: guidelines. When should you or shouldn’t you use treemaps? And what are the parameters of an effective treemap visualization? It took almost a decade after the original treemap paper for anyone to test it (Stasko et al 2000) and even more years for someone to actually compare a treemap with a simple nested list (Andrews & Kasanicka 2007) or a bar chart (Kong et al 2010). Although there is still little understood about how/when to use a treemaps, what we do understand is rarely taught. I’ve rarely seen an introduction to treemaps talk about white space, spatial grouping, visual crowding, area vs length discriminability, or even more practical considerations like when to use a bar chart instead. The first treemaps that most people see are overly cluttered (like this one) or only show 5 numbers (equally pointless). But the vis community should have used some part of the last quarter century to offer more concrete guidelines of what “too little data” or “too much clutter” means for treemaps. We’ve failed to do that, which is why so many treemaps are terrible. You make a valid and important point. Considerable blame for the misuse of treemaps has been earned by the information visualization (infovis) research community, from whose midst treemaps emerged. Actually, some of the worst perversions of treemaps that I’ve seen were created by infovis researchers (e.g., the Voronoi tessellation treemap that was featured at VisWeek a few years ago). The infovis research community, with few exceptions, has little concern for best practices. Many academic researchers believe that it is their role to generate new ideas with little concern for the merits of those ideas when applied to real problems. I’ve spoken for infovis classes at several universities, which are usually filled with computer science students. On more than one occasion when I’ve challenged the students to concern themselves with effective practices they have pushed back, arguing that best practices aren’t the concern of software vendors whose job is merely to provide the tools, not to design them for effective use. In their minds, if the tool is misused, it is solely the fault of the user. If this attitude is common among software developers, it’s no wonder our tools are so poorly designed. Speaking of software vendors, a great deal of blame for the treemap’s misuse has been earned by them. Have you ever seen an implementation of a treemap in a product that was accompanied by good instruction in its use? As an experiment just now, I used one of the best, most popular data visualization products available today to select a data set that consisted of a single categorical variable with a cardinality of one (country = United States) along with the single quantitative variable profit and the tool suggested a treemap as an effective form of display. The result was one big rectangle that filled the screen. The first thing every software vendor that supports treemaps should say to its users is that treemaps should only be used to display large sets of discrete values—more values than they could display using a bar graph, which could be more easily read. Look at the examples of treemaps that appear on software vendors’ websites and you’ll be entertained by a parade of misuse and miss-design. Some of the blame has been earned by people who pose as experts in data visualization but use graphics primarily to entertain rather than inform. Treemaps have become of staple of bad infographics. Lastly, some of the blame has been earned by those who use treemaps in their work (e.g., the fellow who created the monstrous example that I featured in this blog post) without bothering to learn their proper use and best practices. Of all of the groups who deserve some blame, this group deserves the least. Your diagram is not as cluttered as Scott’s, in part because it display less information, but it isn’t necessarily supporting your goal. What are you trying to say? If you were to put into words what you’re trying to say with this graphic, what would those words be? Knowing your intentions will help me and others critique the effectiveness of your graphic. In addition to a description of your intentions, I have two specific questions: 1) Is there a hierarchical relationship between the rectangles?, and 2) Are the sizes of the rectangles meaningful and accurate? I do find it interesting that none of the creator’s stated intentions needed this chart. ALL FOUR* of the points he intended to demonstrate would have been just as easily conveyed with a simple (lengthy) list/table. In fact, a list would be an improvement since lists can be ordered and numbered. * On the fourth point, the chart may even counteract the intended call-to-action, potentially scaring people away from the marketing technology landscape. I’ve been a fan of yours for many years. So on a very strange level, I’m actually giddy that my graphic even came to your attention — although, unfortunately, not for the right reasons. I mostly agree with your critique: from an information visualization perspective, this graphic is a hot mess. I never even thought of it as a treemap (I was originally thinking in a stack metaphor), but I see why you’d categorize it that way. My apologies to Ben Schneiderman (who has also been a hero of mine). From a purpose perspective, however, I would humbly suggest that it has served its purpose: inspiring discussion. By capturing 1,876 different marketing technology vendors on a single slide — that made it very easy for people to include in presentation decks and embed in blog posts (as, ironically, you have) — and doing it in a way that was visually interesting, this graphic spread far and wide and helped trigger a lot of discussions around the state of marketing technology today. There are definitely many other ways that this information could have been communicated. Certainly many ways that would have been better for other purposes. Some of the other commenters suggested a list — which would be simpler and have more direct utility. But I don’t think that would have evoked the same visceral reaction that this achieved. I personally believe there should be a much better way to visualize this landscape that captures its scale and diversity, exposes the specificity of individual vendors, clusters groups in vendors in some kind of semi-meaningful categorization, fits on one slide, and inspires discussion. I just haven’t found it yet. But I completely see that as my own failure of imagination to date, and I’m optimistic about finding a better way to do this. On that note, I’m not sure if I can afford you, but if you have ideas about better ways to visualize this, I would love to engage your services to work with me on it. Either way though, I remain a fan (even though I’m clearly not a model student). Let me begin by expressing appreciation and admiration for the humility of your response. I will happily help you improve this display. If your purpose were merely to incite discussion, you’ve achieved your goal, but this wasn’t your stated purpose. Let’s start from scratch. Please state in words the one or more points that you wish to communicate. Describe your target audience. Describe the platform that you’d like to use for presenting this information (a web page on your site, a printed poster, one or more slides in a PowerPoint presentation, etc.). And finally, describe the action that you would ideally like your audience to take in response to this message. Let’s not assume that a single slide will provide the best solution. Once you’ve clearly stated your message in words, I and others will do our best to propose better ways to communicate your message. My passion is the intersection of marketing and software. My primary objective with this graphic has been to give people — primarily marketers, but really anyone who’s interested in the space — a visceral sense of the scale and scope of the different vendors providing technology to marketers today. It is an astounding number. This graphic shows 1,876 of them, but there are probably more like 3,000 that could reasonably qualify. My intent is mostly to inspire discussion. 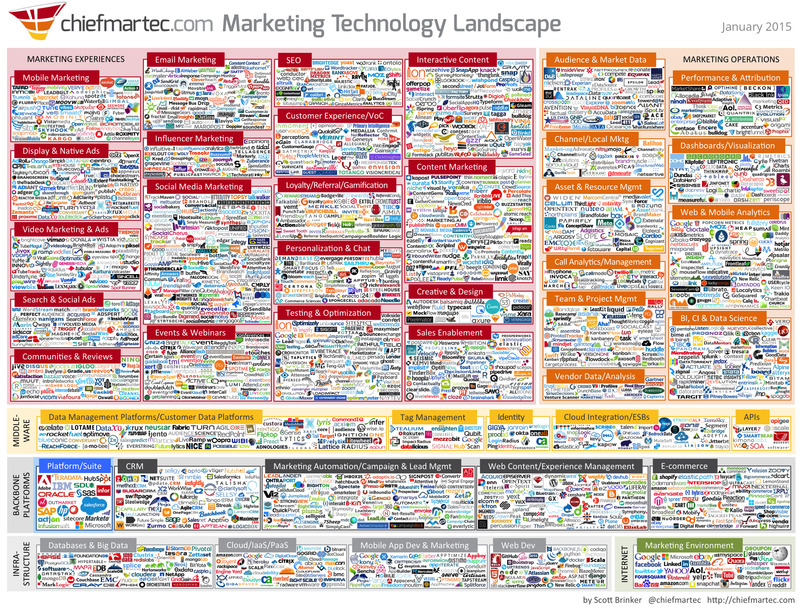 What does it mean for marketing that there are this many marketing technology vendors? The points that I shared in my original post, which you included in a comment above — e.g., this is evidence that marketing has become a technology-powered discipline and that the sheer quantity of these different providers is some measure of the crazy innovation happening in marketing today — are really the discussion points that I personally see in this. I use this graphic as a backdrop for those conversations. 1. As much as possible, represent the true breadth and diversity of the industry. 2. Express specific vendors and (ideally) some flavor of their character (logo). 3. Categorize vendors, however imperfectly, to help reveal some industry structure. 4. Be visually “interesting” to help inspire discussions and spread of this graphic. 5. Fit it all on one slide. The reason I consider #5 important is because a large number of these conversations will happen in meetings and presentations at conferences, and a single slide that conveys as much of the character of this landscape and has some shock-and-awe value is, I believe, very helpful for catalyzing conversations in that context. Note, I’m not looking for gratuitious shock-and-awe value — I genuinely think the state of the marketing tech industry is shocking and awe-inspiring, and I want to communicate that as accurately as possible. – I wanted to show some level of heirarchy (big clusters by color, groups and then the categories as boxes within them). – I decided not to distinguish the relative size of individual vendors — so Oracle’s logo is the same size as a start-up’s logo. This is partly because I don’t have accurate data on a meaningful quantitative dimension for all the vendors to be able to consisently rank them and partly because I think the quantity of vendors is an interesting measurement unto itself, and this lets me fit the maximum number possible. – I am okay with the graphic not being readable on a slide — but I did want people to be able to zoom into a larger version (some people print larger poster versions for their walls) where the individual companies would be readable, yet when zoomed out it would still express some proportional representation of the field. This is what led me to label this a “supergraphic” — although it’s possible that Tufte would weep too at my implementation. – I wanted some small measure of branding for my blog that covers this space — I chose the header and the color scheme, but I acknowledge that the current color scheme probably violates some visualization principles (e.g., the use of red), so I’m completely open to other ideas. The other problem I face with this graphic — the bigger one, really — is that the categories themselves are extremely fuzzy and imperfect. Many vendors cross multiple categories in the real-world. Many have different labels for their categories. This graphic is my subjective oversimplification of the space. If I could have a way to better represent the reality of the overlaps — without this devolving into further goo than it already is — I would love to find it. I’l stop there for now, but if you have other questions that would be helpful in finding a better way to visualize this, let me know. And while I greatly appreciate any free advice that you — or other readers — are willing to offer here, I am serious about being interested in engaging your consulting services if this became a project that required more help than a comment thread could provide. Thanks for taking the time to describe your goals. I’ll attempt to summarize what you’ve said. The number of vendors in the marketing technology space is huge, consisting of about 3,000, and it’s rapidly growing. These vendors provide broad and diverse products and services. These products and services fall into several categories. Individual vendors address one or more of these categories. Provide a visceral sense of the scale, both overall and per category. Convey the hierarchical nature of the categorical structure. Provide a means to look up specific vendors to see what products and services they provide. What does the scale and diversity of marketing technologies reveal about the space? Does the large and growing number of vendors in the space indicate that useful innovation is increasing? Is the space well structured to address today’s marketing needs? How can one successfully navigate the space to find the best fit in products and services? Please let me know if I’ve captured your intentions accurately and thoroughly. Once you have, I’ll set up a thread in my Discussion Forum where I and others can offer suggestions. You’ll notice that I’ve expanded the discussion questions. If you truly wish to inspire discussion, it helps to anticipate the issues that ought to be discussed and then design the display to support them. It is often that case that when people say that their information graphics were designed primarily to inspire discussion, they use this explanation as an excuse for the low density of information that the graphic conveys and the unreadable way in which it provides that information. Discussion, however, benefits from good information communicated well. The better the information and the more effectively it’s communicated, the more it leads to productive discussion. And, if discussion is your goal, you might want to encourage it directly by posing specific questions? For example, “Does the explosion of vendors in the marketing technology space indicate an increase in useful innovation?” I’m using this particular question as an illustration because you stated a conclusion that you’ve drawn from your graphic that probably isn’t true. Having more vendors in the space does not necessarily mean more innovation—certainly not more useful and effective innovation. It could actually mean the opposite and probably does. Yes, I mostly agree with your summary. 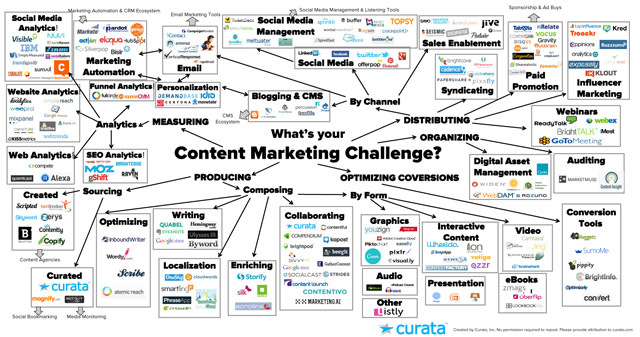 For the facts, I’d made peace with the constraints of my abilities that I may not be able to fit ALL of the martech vendors on this graphic — but I wanted it to be as many and as representative of a sample as possible. If there’s a visualization that could accommodate 3,000 vendors without significantly trading off the other objectives, that would be terrific. But I think a graphic that can accommodate as many as there are now (1,876) — or possibly fewer, if the other benefits of the visualization are relatively better — is worth considering. Presenting fact #4 (individual vendors belonging to multiple categories) would be fantastic, but if I had to give that up to achieve the first three, that would be acceptable. For the discussion questions, I fully agree with #1 and would love the visualization to help with #4. #2 and #3 are great questions — and I’m delighted if the graphic helps inspire those conversations — but there are some prescriptive notions embedded in them that I think make them harder to answer. How do you measure “useful” innovation? (Open philosophical question, but even if you pick an arbitrary metric, like return on investment from features offered, actually measuring that is impractical at this scale.) I acknowledge that “number of companies vying in the space” is a poor metric of innovation from a qualitative perspective, but from a raw evolutionary view of innovation, it represents the quantity of variations being tried in the marketplace in parallel. Is the industry “well structured” to address marketers needs today? Almost certainly not. But even if we have hypotheses about how it should evolve to better serve those needs — and my sense is that there are many competing hypotheses in the industry that are viable — my expectations of the graphic were more modest: if this is the reality of marketing technology today, how do we work with it today? That being said, I’ll keep an open mind to any questions that it raises for you or others, as I am already seeing how these different questions could inspire very different ways to visualize the field. Again, I’m really appreciate of your time and others who would like to help. Twice now I’ve written lengthy responses to you and twice I’ve become distracted and closed my browser without submitting the response. Let’s hope that this third attempt is the charm. Let there be no doubt: you will not address all of these intentions and requirements with a single graphic. Fortunately, this isn’t necessary. Attempts to do too much with a single graphic always result in a display that does little well. It is much better to provide multiple displays that each address a limited scope of objectives well. You will not show how all 3,000 vendors or even your pared down list of 1,876 each address the various categories of marketing technology products and services and provide a means for people to look up specific vendors with a single graphic or even multiple graphics, because this is not something that graphics do well. A simple table, however, could do this well, assuming that you have the data. Imagine a table with a row for each vendor, alphabetically arranged for easy look up, and a column for each product and service, grouped into your larger categories (marketing experiences, marketing operations, etc.). The columns could be quite narrow, just wide enough for the cell at each intersection of a vendor and product or service to be seen when filled in with color to indicate that the vendor provides that particular product or service. This table could serve as a useful addendum to a summer infographic. I have not embedded “prescriptive notions” in any of the questions that I’ve proposed. For example, I did not prescribe how the term “useful” should be defined. I’ll gladly suggest a definition, however, if you find it hard to define in this context. A marketing technology, whether it’s innovative or not, is useful if it does something that matters. The better it does that thing that matters, the more useful it is. You need to concern yourself with the usefulness of these technologies. Finding a way to measure usefulness is not difficult. The organizations that purchase marketing technologies expect that they are useful. Vendors should not be selling technologies that they have not already confirmed as useful. If they are selling hypotheses, they should be telling their customers that they are paying in money and time for the privilege of being test subjects in an experiment. I’ll repeat something that I said previously because it’s important. The number of vendors does not correlate with the number of useful innovations. Few of the vendors in the space have produced useful innovations. If you eliminated all of the vendors that have not produced useful innovations, the number of innovations would not be reduced. Your conclusion that because the number of vendors has increased, the number of useful innovations has also increased is not valid. Even if it were, let me share another truth that I’ve learned. Innovation is highly overrated. Innovations are only needed when existing approaches won’t work. I suspect that most successful marketing efforts rely on proven approaches done well. Based on the data that you have, there is relatively little that you can say in an infographic. Here’s the message, as I understand it. The best way to provide a visceral sense of scale that’s actually meaningful rather than gratuitous is to compare the number of vendors to something that will help people understand the magnitude as huge. For example, you could use a simple bar graph to compare the number of vendors in marketing technologies to the numbers of vendors in other areas of technology such as healthcare or communications. You could also use a simple line graph to show how the number has quickly grown over the last few years. To show how many vendors address each of the products and services, you could also bar graphs: one for the high-level category and one for the individual products and services. There isn’t much more to say based on the facts that you have. I think you have a better opportunity to make a useful impression on people by inspiring them to ask the questions that apparently aren’t being asked, such as the one that I proposed about usefulness. I believe that an infographic that presents the basic facts that you’ve collected in a clean and simple manner and then asks a few important, thought-provoking questions, would be more useful than the one that you have. First, let me thank you for the time you’ve taken to engage with me on this. While I am far from an information visualization professional (obviously! ), I’ve been fascinated with the topic for many years, and you are one of the most prominent voices in the field. I kid not you not, I have a copy of Information Dashboard Design in one of the three stacks of books by my bed that I can’t bear to relegate to my “archives” (re: stacks of books in my basement). In a world of exponentially expanding data — and ever more attempts to visualize that data and interpret it — I think this is one of the most important disciplines for everyone to study. As with Darrell Huff’s classic, How to Lie With Statistics, I believe these are principles that all information-based professionals should learn, if for no other reason than to be informed consumers of the data that we’re beseiged with on a daily basis. That you’ve taken the time to think about what I was trying to do with my graphic and offer your sincere recommendations for how to make it better — not just once, but three times with this last comment :-) — is a great honor for me. There are so many facets of this that I would love to discuss with you further. But I am conscious of the fact that you no doubt have many demands for your time, and at some point, this discussion thread may lose its value for further debate. When the “OMG, this is the worst bastardization of the treemap ever” post gets pulled into an extended discorse of the crazy state of marketing technology, I would understand if that’s a tangent that you and your readers would be reluctant to pursue. I respectfully disagree. Oof, that kills me even to write that. Is it hubris on my part to think that a bar graph of the number of vendors in marketing technology compared to the size of other software markets is a lesser representation of the marketing technology landscape than my “eyesore?” Possibly. Even, probabably. If my UI professor could see this (he probably reads your blog regulary, so he might), he would probably retroactively revoke my degree. But I can’t deny my belief that the compression of this landscape into purely a quantitative number in a bar graph is a massively lossy compression of information. My sense is that such a bar graph would not have the same visceral impact for people as seeing the actual density of real logos — which forces people to recongize that these aren’t just abstract data points, but living organizations of real people striving to have an impact on the world. But consider the stars in the visible sky. You could quantify those into a number, and put them into a bar graph that compares them against other quantified reference points. (I’m drawing a blank on what you’d compare them against. Gumballs in a vending machine?) But that bar on the graph would not be the same as looking up at the sky on a dark night — or even looking at a simplified map of the cosmos on paper. There’s something about seeing the objects themselves, and not just the numerical count of those objects, that impacts our perception of them. No doubt, this triggers all sorts of biases in our analytical measurement of things — which is probably “bad” in many contexts — but to the degree that it evokes an emotional reaction that inspires us to contemplate, wonder, and question things that have implications far beyond that singular quantified axis is helpful to our greater intellectual progress, no? When the world is overpopulated with bar graphs, is their impact diminished? Just as we have developed banner blindness to display ads on the Internet (sorry, a metahpor for the world I know), do we run the risk of failing to be moved by data represented in “standard” formats, because the format itself has been overused? A big bar compared against a bunch of smaller bars may be a truthful representation of the marketing technology space, but is it compelling enough to inspire widespread conversation and debate? I fear not. You could say that the world is overpopulated by math equations too, but that doesn’t change their truth. I’d agree, and acknowledge that honest bar graphs are truth. But while we might long for a world where such analytical truth dominates (maybe), there are other dimensions to our reality that motivate us, inspire us, and stir our interest and imagination. Those other dimensions may warp our perceptions of their numerical underpinnings; but the inverse seems true as well: quantification on any one dimension filters out the harmonics of that signal that reduce what we absorb and feel. I do think there’s an ethical standard by which any visualization should be held: are you trying to represent the reality of something or are you trying to distort it? It is my sincere desire to pursue as accurate of a representation of the marketing technology landscape as possible. But under that umbrella, I think there is a tremendous range of visual possibilities. My apologies for a bit of a ramble above. I’m thinking through this and felt it would be helpful to some following this discussion to “hear” the points and counterpoints running through my mind. I may be wrong, possibly on multiple levels. You’ve definitely given me a lot to think about. I would argue simply that cramming all of the company logos into a graphic says nothing about the significance of how many companies are out there, or what they do – it simply demonstrates that cramming 3,000 logos into a graphic is a big ugly mess. I don’t see how that sparks meaningful debate about the state of the market. Is 3,000 a lot? What was it 5 years ago? Has the diversity grown? Has the scope of work done changed? How many companies are doing *useful* work? I don’t see how a wall of logos addresses any of these issues at all, or how it provides anything meaningful. If I cram the hundreds of thousands of logos from [pick any larger industry] into a graphic and compare it to the 3,000 logos…what then? And the answer I posit is: you don’t. I can see both sides of this argument, albeit with an exception. The chart alone serves no useful purpose in terms of communicating the intended message, but used as a preface to a conversation supported by more thoughtful and restrained data visualizations (such as you outlined Steve) may offer certain audiences the benefit of comic relief before the hard conversation begins. So yes, I see the chart as comic relief. It’s a punchline to the joke of how complex some topics are to talk about, and it does serve to hook the audience into the conversation – for a moment. But like any good joke, timing is everything. Presenting data involves crowd control, and a little humor can go a long way to building a level of receptivity that diving right into the data often cannot. At best it deserves a moment on the screen, but could be even funnier if you asked someone in the audience to throw a dart to illustrate how many companies go about selecting the right vendor! Let me respond primarily to that portion of your latest comments that seems to express their essence: “the degree that it [a data display] evokes an emotional reaction that inspires us to contemplate, wonder, and question things that have implications far beyond that singular quantified axis is helpful to our greater intellectual progress, no?” If your graphic accomplished this and did so well, it would indeed have value. The problem is, it doesn’t. It says very little, and what it says it doesn’t say well. You say that you want to inspire discussion, but your graphic doesn’t say enough or say it clearly enough to evoke the level of discourse that the topic deserves. You should shoot for a higher level of discourse. The only discussion that your graphic directly inspires is “Wow, there are lots of marketing technology vendors” and “This taxonomy of marketing technology products and services is interesting.” If your taxonomy is helpful, your graphic has provided something useful, but not in the most effective way. A hierarchically arranged list would have presented this information more clearly. What are you hoping to inspire your audience to do? Certainly you are hoping that they’ll do more than your graphic equips them to do. Perhaps you’ve become too immersed in the world of marketing to envision a high level of meaningful discourse as opposed to the superficial level at which marketing typically engages people. If this is the case, step back, clear your head, and imagine that you’re trying to inspire a level of discourse that could change the world for the better. To inspire that, you would need to provide people with more information, better information, and then help them navigate that information in a way that might lead them to respond knowledgeably and usefully. You expressed concern that by questioning the efficacy of too many bar graphs you might be treading on “sacred ground.” When I was a young man in the ministry, there were things that I treated as sacred ground. Long ago, however, my worldview switched to that of a scientist. In science, there is no sacred ground. Everything is questionable. That’s a basic tenet of science. I value bar graphs and other forms of data display because they work. If the cease to work, I will no longer value them. I embrace any form of display that does the job of effectively communicating data and assisting people in thinking about data, resulting in understanding. Anyone can cram a bunch of logos onto a single page. That’s not a meaningful accomplishment. That’s not even an undertaking that requires skill. It’s certainly not the product of expertise in the realm of marketing. You have expertise. Put it to use. Do something to help people understand marketing technologies better and use them more effectively. Don’t be satisfied by the superficial “Wow” that your graphic elicits. Okay, it does seem like we’ve pretty thoroughly beaten this topic (and my self-esteem). :-) I do really appreciate everyone’s time and candor and the suggestions of different approaches to communicating the information and ideas behind this graphic. You’ve certainly given me a lot to think about, and I am grateful for that. However, to be candid in return, while most everyone on this thread seems to agree that this is a terrible and ineffective graphic for communiticating my objectives, my experience says otherwise. I’ve had thousands of people across the marketing industry who have told me how helpful it’s been for them see this view of the landscape. It has triggered hundreds of conversations, been included in hundreds blog posts, featured in hundreds of presentations. I’m not saying that makes it great. I’m woefully aware of so many of its flaws. But it does make it effective for the purpose it was intended — it has, objectively, served to inspire the very discussions that I hoped it would. It’s not a hypothetical “could this work?” It’s just a fact: it did work. Could other approaches have worked better? Possibly. Probably. And I’m certainly eager to keep trying and exploring alternatives. If you merely wanted thousands of people to tell you that this graphic was helpful to them, then you achieved your goal. If your goal was to communicate the information that you claimed the graphic conveyed, you failed. If your goal was to inspire meaningful and useful discussion, you failed. How do I know you failed to inspire meaningful discussion? Your graphic doesn’t contain enough information to do this. You seem to think that our difference is philosophical. It isn’t. Whether you accomplished your goal is not a philosophical question, it is one that requires us to examine the evidence. I can easily demonstrate that you didn’t achieve your goal by showing your graphic to people and asking them to tell me what they get from it. They won’t get more from it than I’ve identified in my previous comments. If you believe I’m mistaken, tell me what people can possibly get from your graphic beyond the basic facts that I’ve identified. Unless you’ve asked the thousands of people who expressed their appreciation for your graphic what they got from it, you have no evidence on which to base your claim. Provide evidence that your graphic inspired meaningful discourse or that it communicated any of the information that you claimed that it did in the write-up that accompanies your graphic and I will gladly relent. I haven’t been trying to damage your ego. Just as you’re trying to inspire people in the realm of marketing, I’ve been trying to inspire you. The biggest failure of our discussion is mine. I haven’t been able to open your mind to embrace better forms of communication and the importance of meaningful rather than trivial discourse. I would like you to extend your reach to pick something other than low-hanging fruit. You’re stuck and I’ve failed to unstick you. This isn’t about winning or losing. This isn’t about your ego or mine. This is about doing the best that we possibly can. Perhaps I’m wrong, but I believe that you can do better. How to do better is informed by science. The desire to do better and the belief that we should, that’s the part of this discussion that’s philosophical. I don’t like the display, although I do see some value in using the logos. But the more fundamental question (to me) concerns the real underlying message. Is marketing really more technologically driven than any other sector of the economy? We could make a similar visual for sports, for health care, for logistics, etc. There are a lot of players in every sector – the world has more IT than ever before. But without some structure, we have no way of knowing whether IT comprises more of the value chain than before (or less, or more in the area of marketing than before, or more in marketing than in operations, etc.). The real question concerns how the value chain in marketing has changed and the graphic provides no information about this. To state this a different way: I make my living in university education. I could (with some work) devise a similar chart for all of the products/players involved in education today. It would grab people’s attention and the logos would probably contribute to this. But it would not tell me whether technology has become a larger part of the educational landscape and it would not reveal any of the meaningful patterns concerning technology (how it rearranges the value chain in education). I think the problem with the graphic is that it does not tell us anything. It grabs attention and provides a visceral feeling that technology is more important in marketing than it used to be – but devoid of any evidence that this is true. I am fairly sure that less money is now spent on classic market research (focus groups, surveys) than in the past, and I suspect that more is spent on predictive modeling tools, databases, etc. But the graphic appears to provide answers without making the questions clear and without providing any evidence. Did any of them tell you how it helped them? What did they say? Okay, but that’s not surprising because it’s on the Internet. What did these conversations / blog posts / presentations have to say about it? How do you know that any of the hundreds of discussions were worthwhile? I’ve spent twenty odd years being an operational researcher. Ever since I read Tufte’s book and went ‘ooh, mark the quartiles of the scatterplot on the axes… Cool!’ I’ve been fascinated by how we might improve graphs to make them ‘better’ — and by better, I mean help people make rational diagnoses of important issues then plan and implement effective improvements. In that twenty years, though, I’ve discovered that there are a lot of successful, happy people who don’t work like that. There’s a joke in the British Civil Service “The plural of anecdote is policy”. How people feel about stuff is often more important than reason. They feel their way through, using their trusted intuition, and cool graphics help them to provoke and direct their thinking and, more importantly, their actions. For this audience, Scott Brinker is spot on with his graphic. For these people, it will be interesting and engaging — a backdrop to their conversations and the cause of new ideas. In the last 5 years, information visualisation has really taken off — but it’s illuminating to see how much of it lacks the ‘utility’ suggested by Tufte and others. The ‘Tufte’ school (or choose your favourite!) is using reason to try and persuade people who are suspicious of cleverness and driven by their intuition and feelings. Many of the decisions that are routinely made in organizations, including the British Civil Service, require slow, deliberative, logical thinking, but are made on the basis of intuition. People such as Tufte and I who teach data visualization best practices are trying to address those situations when people need to process information in a slow, deliberative, logical manner to increase the understanding on which they base their decisions. If Scott Brinker’s goal was merely to provoke thinking with no regard for the content of that thinking, he may have succeeded. According to his own stated purpose, however, he set out to present particular facts that he failed to communicate. I’m basing my critique of his graphic’s effectiveness based on his own objectives, which he failed to achieve. I completely agreed your reasoned critique of Brinker’s graphic against his stated goals — it helped clarify and add to my own thoughts on seeing the graphic. This is surely excellent ‘slow’ thinking! Oddly, I was thinking of Kahneman’s most excellent book when I wrote my last post. The excellent work of yours, Tufte and others is exceptionally helpful for slow thinkers — I use the methods pretty much every working day, and I know that I’ve helped lots of organisations by exactly these methods. However, I have found that there are many people who are actively turned off by the approaches; they are intrinsically ‘fast’ thinkers, not ‘slow’, and their intuition trumps (or runs roughshod over!) reasoned displays of information. However, some inarticulate nonsense put into some absurd bubble graph has them enthused like they’ve found the font of all knowledge. My entirely unclear hypothesis was that if you gave (in a well-designed experiment) one bunch of senior executives best practice information visualisations (group A), and another group a bunch of pretty pictures (group B), group A would not outperform group B. That is, the methods the slow thinkers hold dear are not ‘generally’ beneficial because the majority don’t think like that. Regardless of his stated aims (which were probably unread by those copying the graphic!) I suspect that Brinker’s graphic has the sparkle that resonates with fast thinkers (whilst being dull to me! ), in the same way that Minard’s map of Napoleon’s march has the sizzle that makes slow thinkers pour over the content (but is tasteless to fast thinkers…). I would personally like to know how I can make my visualisations resonate (a bit) more with the ‘fast’ thinkers, without having to try and fundamentally change their world views. Thanks for the clarification. You wrote that “many people…are intrinsically ‘fast’ thinkers.” Actually, we are all intrinsically fast thinkers. Slow thinking isn’t a trait of some but not others, nor is it a preference; it is a mode of thinking for which the human brain has been repurposed, in which we can all partake. Unlike fast thinking, however, it involves hard work, which takes discipline, training, and practice. Everyone engages in both fast and slow thinking, but the proportion of each varies considerably among people. People who avoid fast thinking when it’s needed do so for a variety of reasons, one of which is laziness. For many people, however, it simply isn’t a mode of thinking that their life experience has encouraged them to cultivate. Regardless, when a decision requires slow, deliberative, logical thinking, no amount of fast, intuitive, emotional thinking will outperform it. In your hypothetical experiment, the data visualization that does the best job of informing, resulting in understanding, will outperform the one that fails to inform. Therefore, whenever people need to assess the evidence thoughtfully before making a decision, a data visualization that is designed to inform in a manner that engages slow thinking will always support a better decision. Let’s talk about your statement, “I would personally like to know how I can make my visualisations resonate (a bit) more with the ‘fast’ thinkers, without having to try and fundamentally change their world views.” It isn’t their worldviews that need to be changed. Instead, we must encourage them to shift into slow thinking, even if it isn’t their preferred mode. Nothing that we do to appeal to their preference for fast thinking will solve the problem if we can’t get them to shift into slow, deliberative, logical thinking when the situation calls for it. How do we do this? Two possibilities come to mind. One is to incorporate appealing aesthetics into the design, but do so in a way that doesn’t compromise the integrity of the information and the quality of its presentation. This requires visual design skill, which takes time to develop. People like my friend Alberto Cairo have cultivated this skill to a high level. The other method is to include something that connect with people emotionally. For example, if your visualization is telling the story of global climate change, you might include a photograph next to the chart (preferably not in it) of a polar bear struggling for life in the midst of melting ice. You might also connect to people emotionally with a good title, which catches their interest. This is what journalists have done traditionally. What did Scott Brinker do to grab his audience’s attention? It wasn’t aesthetics that did this, for his design is visually unappealing. I suspect that people who liked Scott’s chart had their interest piqued by the novelty of squeezing all of those logos into a single chart. Novelty — something that elicits surprise — is appealing, but not necessarily informative, as in this case.